The heart is our emotional dimension. This dimension has two domains; a personal domain that centers on our emotions and a social domain that centers on our relationships with others. The personal domain encompasses knowing and managing our own emotions, motivating ourselves, and recognizing how we feel about ourselves. The social realm of this dimension consists of recognizing the emotions of others and building relationships with others. Whether we are aware of them or not, our emotions influence most of what we do and how we interact with others. 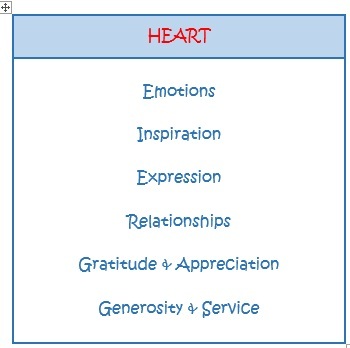 Emotions are what drives our behavior and determines our passions and our motivations. They are also the foundation of our ability to understand ourselves and relate to others.